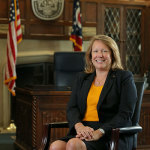 Dr. Sharon L. Gaber began her tenure as 17th president of The University of Toledo in July 2015. A city and regional planning expert, Gaber came to the UT presidency following six years as provost and vice chancellor for academic affairs at the University of Arkansas. At UT, Gaber is focused on elevating at the national level one of the country’s most comprehensive institutions of higher education through increases in externally funded research, student enrollment and graduation rates, philanthropic support, and the recruitment of leading academic and clinical faculty. In addition to more than two dozen grants totally nearly $2 million, Gaber is the author of 40 peer-reviewed articles researching and analyzing regional and urban planning, public policy, and the social dynamics that affect community decision-making. As president, Gaber serves on the boards of trustees for the Toledo Regional Chamber of Commerce and the Regional Growth Partnership. At Arkansas, Gaber was a member of the board of directors of the University of Arkansas Fayetteville Campus Foundation, the Washington Regional Medical Center, and Simmons First National Corp. She was also vice chair of the Arkansas Research and Technology Park board of directors. She led the SEC Provosts group, a partnership of the chief academic officers of the Southeastern Conference, and is a member of the Urban Affairs Association, the American Planning Association, the Association of Collegiate Schools of Planning and the Association of Public and Land-Grant Universities. Prior to that, she served in multiple roles in the provost’s office at Auburn University; these included interim provost and vice president for academic affairs, senior associate provost, and associate provost for academic administration. She served as an associate dean in the College of Architecture, Design and Construction and before that, was department chair and assistant chair in community and regional planning at the University of Nebraska-Lincoln. Gaber, who co-founded the Women’s Commission at the University of Arkansas, was named Academic Woman of the Year at Auburn in 2009 and earned the Professional Planner Distinguished Leadership Award presented by the Alabama Chapter of the American Planning Association. She earned her bachelor’s degree from Occidental College, a master’s degree from the University of Southern California, and her doctorate in city and regional planning from Cornell University.